Do you have child or teen who is always taking pictures? You don’t have to be a professional photographer to get great results or to teach your kids how to. And you don’t have to have an expensive cameral, either. Whether you have a point-and-shoot, a Digital SLR, or just your phone, you can get amazing results on vacation, at special events, or just capturing life’s everyday moments. The advice I always give to people interested in photography: take a lot of pictures! You won’t know what works and what doesn’t if you don’t try. Experiment with different lighting situations, different perspectives, different subjects, and then analyze the results. What is different about the pictures I like, versus the ones that aren’t as appealing? What is it about the picture that draws my eyes first? What time of day do I think this was taken? To get you started, I’m sharing my top ten tips for taking better pictures. If you aren’t taking a picture of the scenery on purpose, then let the subject shine. 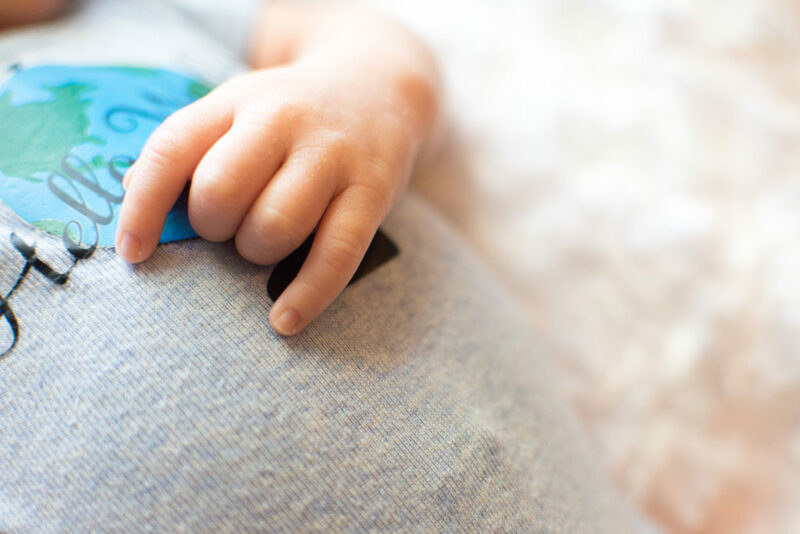 Capture the details by taking parts of babies, buildings, animals, etc. Let them shine through in your photos by not always posing them, or have people interact in some way like tickles or hugs. 4. Take images as well as pictures. At Christmas I like to take pictures that capture the feeling of the season as well as the events. Birthday candles, Easter eggs, flowers at a celebration help capture the memories of the atmosphere. Imagine that there are lines dividing an image into thirds, both horizontally and vertically. If you place your subject at any of these intersections you can create a dynamic picture. Get the Curriculum for your homeschool group or co-op! Windows, playground tunnels, and trees, all make natural frames for your subject. Or highlight a feature by isolating it—for example, hide part of your subject’s face to emphasize the eyes. Shoot up or down instead of eye-level. If you are taking a picture of a small child or a pet, get on their level. Yes, I’ve taken many pictures lying in the grass on my belly! Snap the picture as they walk away instead of a front view. If the background is brighter than the subject, use it as a opportunity to take a silhouette. 9. Take advantage of golden opportunities. Take pictures about an hour to 30 minutes before sunset to get a beautiful golden tint to your photos. 10. Reflect on your subjects. Notice the reflections you see in mirrors, water, windows, and other surfaces and take advantage of the view. So get out there and take some pictures. A lot of pictures! Because the best way to learn to take better pics is to practice, experiment, and have fun. 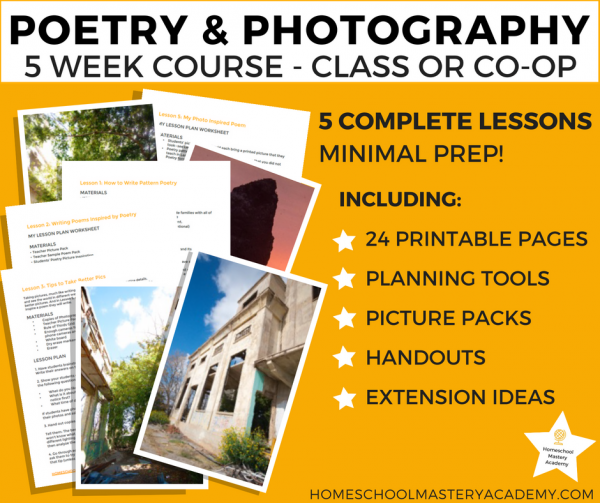 I’ve teamed up with Homeschool Mastery Academy to create a delightfully different curriculum for your homeschool group or co-op! 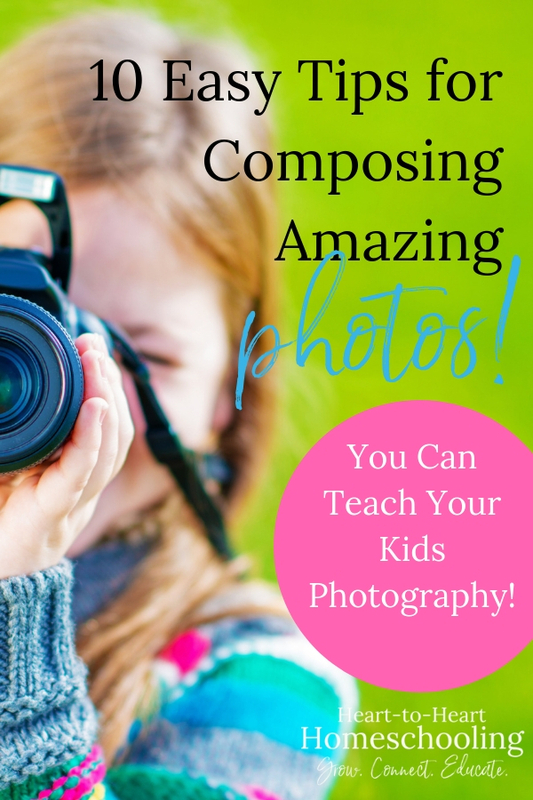 You’ll find these tips along with lesson plans to teach a unit on Photography and Poetry. © Kay Dawn Chance, Kay Chance Photography, and Cultivate My Heart, 2017. Unauthorized use and/or duplication of this material (including the photos in this post) without express and written permission from this site’s author and/or owner is strictly prohibited. Excerpts and links may be used, provided that full and clear credit is given to Kay Chance and Cultivate My Heart with appropriate and specific direction to the original content. This article was adapted from one I wrote for the 2015 Christmas Edition of Homeschooling Today Magazine. Hi! Thanks so much 🙂 For the most part, I use paid and common use stock photography for my posts with only a few of my personal pictures thrown in. I hope to move to using more of mine in the future, but I don’t have images to go with all my topics right now. As for this particular post, they are my photos (except for the featured photo on the blog) and I’m planning on doing a few more posts in relation to teaching & learning photography. Thank you again! I’ll definitely look into signing my own so people will know. I have noticed I love flowers and candid kid shots. Kids smiles and beautiful flowers are so bright and happy. I love it! I guess that explains my instagram. And photos of things we love are a great way to lift our moods! Loved the tips. I’m going to go over them again! These shots are gorgeous! I love photography and I started teaching my son in his fourth-grade year of our homeschool. So much fun! Thanks so much! One of the things I love about homeschooling is sharing our passions with our kids!